A glimpse into a completely ordinary life that involves a lot of metaphorical juggling - not a spider. If this helps one person, even just one, it'll be worth it. The human brain is extraordinary in it's ability to feel emotion. What are actually little electric pulses and signals inside our head can trick us into experiencing feelings such as love, jealousy or sadness. Of course, it doesn't feel that way when you are experiencing these emotions, because often the circumstances in which the particularly strong ones occur are so overwhelming, so in your face, that you can't focus on anything other than that feeling, be it of happiness, fear, depression or otherwise. Mental health, particularly in young people, certainly isn't taboo in today's society. In fact, it shows how we have progressed in that it is almost a hot topic in education and in the media, an example of which can be seen in the recent 'repost your first profile picture and donate' online campaign. Personally, however, all this talk just seems like white noise to me. Yes, we have established that mental health issues are a growing problem, steadily increasing as a result of factors like cyber bullying, but aside from discussing the fact that there is a problem, there is a notable shortage of practical and pragmatic advice on what you can do to protect yourself when such issues affect you. You get the usual spiel of 'go to someone you trust,' and 'don't listen to them,' but look beyond that and what is there? A void. First of all, take the voice inside your head (the voice you think with) and conjure it into a person, a mini version of you. Now walk that person into an imaginary room and lock the door. Leave all the negativity, leave the world in general outside: yes they won't go away but we'll deal with them later. Whilst you're in there, in the metaphorical quiet of your private room, ask yourself a few questions: 'Am I perfect?' 'No.' 'Does it matter?' 'No.' 'Am I breathing, do I have a heartbeat?' If yes, then you are a miracle. It sounds a little goofy I know, but sometimes it helps to remind yourself that you still have the fundamentals of life inside you, and that's always something to go on. Next, try and think of something that makes you happy. It might take a while to find it, but trust me, you will. For me it's my friends, I say their names, I think of the last time they made me laugh. Now focus on that little ball of positivity, and imagine it's like a fire that was just lit in that virtual room which is warming that little person from the inside out. Okay, now when you're ready, you're going to unlock the door and leave the room. You've been refreshed, and you're strong enough to make sure the negativity waiting outside doesn't rush in like flood water and extinguish that fire you've lit inside. With your mind feeling a little more composed, it's time to check in with the rest of your body. Do you have any aches or pains, a bruise which won't go away? Find them and focus your attention on them, on that physical feeling. If you're standing, feel the contact your feet are making with the ground, feel how strong it is, how you are being kept anchored to the earth by that force called gravity, but also by the fact that you are a living, breathing, human being, you exist, you take up space, you have mass, you matter (sneaky pun there for any physics geeks). If you're sitting, do the same, maybe grab the arm of a chair and squeeze it tight, just to remind yourself that you are a physical being, and those wifi signals that sent you your Twitter/Facebook feed? Yeah, they most certainly aren't. So to recap, you've filled yourself with positivity and reminded yourself about the physical world around you, and anchored yourself to the ground. Now with that anchor in mind (it helps if you have something to hold onto), you can face that negativity again. But this time, you're the big person in this situation, steadily fixed to the ground, and that negativity is light, like a helium balloon. So light in fact, that it might just fly away, and you'll willingly let it go. It doesn't even have to leave completely: the point is, it isn't weighing you down anymore. Now don't get me wrong, I'm not saying that every time someone wrongs you or hurts you that you should just forget about it- you can simply use the above to help lessen, or even completely rid yourself of, the feelings surrounding it, because those feelings won't affect anybody but you, and they won't help your situation. Realistically, whilst hurtful comments do have the ability to get inside your head, that's your space, and it is within your capabilities to push them back about again. You control your headspace, nobody else. Keep yourself anchored to the ground and that's all you need. These feelings will come and go, but in your life, you are the one thing that, will without end, be constant. This was my 13th year attending the BT Young Scientist and Technology Exhibition, but I have to say, it certainly wasn't unlucky. The thing about this rather special event is that it hits you like a wonderful brick in the face right after New Years, and you are treated to a fantastic few days before it suddenly ends and you are left to think of ways to make the rest of the year pass quickly, just so it can be time for the BT Young Scientist again. I like to think that every year of the BTYSTE is unique in its underlying ethos and theme, and for that reason I come away with a different impression from each exhibition. This year I was certainly struck by a sense of diversity and curiosity from the stands. Even within categories, topics and methods differed hugely, and it seemed like students were investigating subjects in which they had a genuine interest (rather than just bunging in a project for the week off from school). I'm not a judge, so I obviously can't comment on the standard, but I know that I felt more enlightened walking away from most projects than I ever have in previous years. I was lucky that at the BTYSTE I had the opportunity to do a little bit of everything. For one part, I was in charge of coordinating the activities of the Digital Youth Council. The BT Young Scientist gave us the opportunity to get our name out there to the student body: we conducted student interviews about digital learning and of course asked about their projects; and performed a pilot of a learning beyond the classroom 'School Skype' where RDS Primary Science Fair participants videochatted with their friends back in school to tell them about the exhibition. Although organising the events was a little stressful (you may have seen me looking a little haggard on Wednesday when we had several camera malfunctions) they were a huge success, and the Digital Youth Council will build on our activities at the BT Young Scientist at future events. St. Peter's Bray Students with BT CEO Colm O Neill and Mick the BT redcoat! During the times when I wasn't rushing around chasing a camera, I also acted as a mentor for the projects of Kinsale Community School (which basically just involved giving them water- we're an independent bunch). I love the sense of team spirit amongst the Kinsale projects this year, and watching my friends coming out of judging sessions with smiles on their faces brought me so much happiness. Something not often mentioned about the BT Young Scientist is the effect it has on people's personalities, particularly those in younger year groups. I now have friends in first and second year who I wouldn't have known at all if not for the BTYSTE acting as the gel that holds us all together. Students who I met at their first meeting in September and were too shy to speak to me were bursting with stories for me every evening after the exhibition, whether about their judging, new friends, VIP guests, or just something unusual happening near their stand! I know that being a student of Kinsale Community School people might expect me to speak about the awards ceremony, where we did get a few prizes. But for me, and indeed all of Kinsale's entries this year, it is 100% not about the trophies. Of course it brought joy to my heart to see people who had worked, and who had put blood, sweat and tears into their projects get recognised, but that's not what the BT Young Scientist is about. Out of more than 2000 entries, 550 projects qualify for the RDS, and when you walk in the doors of the exhibition, that is you claiming your prize: the experience of a lifetime. But of course, there are winners, and this year it was Eimear Murphy and Ian O Sullivan from Colaiste na Treasa in Kanturk. They were the well deserved BT Young Scientists of the year for 2015 for their study 'Alcohol consumption: Does the apple fall far from the tree?' Their being the second Social and Behavioral project to win in the 51 years of the exhibition, I honestly did feel like I was witnessing history seeing them up on stage. Their study was incredibly well carried out and interesting, but more importantly, from the short time I have spent with them, Ian and Eimear seem like great craic. 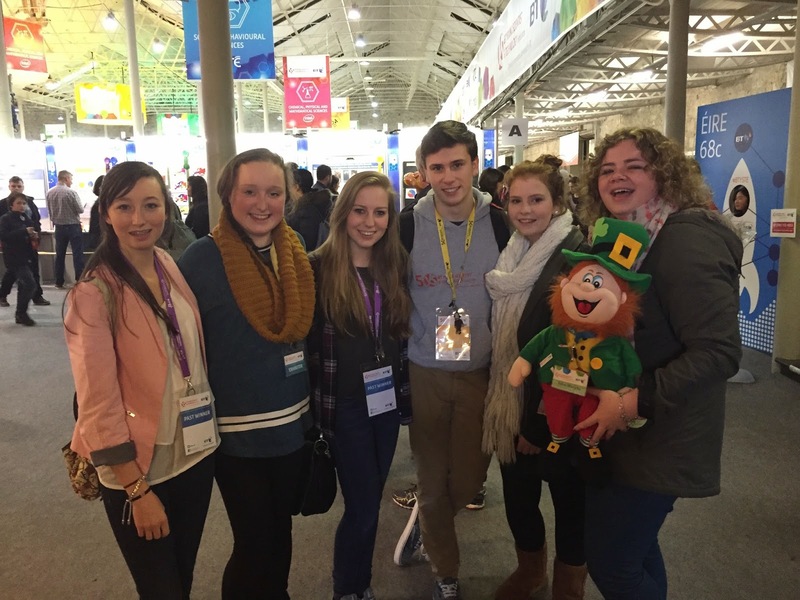 I look forward to getting to know them over the next year, and they are a fantastic addition to the BTYSTE Family! There's too many people to thank for an amazing week at the #BTYSTE , so I'm just going to pick a very important group of people who I like to think of as the unsung heroes of the BT Young Scientist and Technology Exhibition: The BT Redcoats. They work tirelessly all week to make sure students, sponsors and guests have an amazing time, completely voluntarily, and they're great banter too! I briefly had the honour of wearing a coveted red coat for a few minutes on Saturday evening, but the responsibility was too overwhelming for me: I'll leave it to the experts! There's something quite special about the BT Young Scientist that nobody can quite put their finger on. You walk into the exhibition hall and you are hit with a sudden wave of heat, noise, and energy, which are all combined into a buzzing atmosphere. There isn't a frown in sight amongst the students, visitors or staff, and topics of conversation range from hair to the complexity of protein molecules. It is this fusion of youth, fun and science that students experience at the RDS, and it is for this reason that the graduates of the BT Young Scientist and Technology Exhibition are well equipped, confident, and competent students who blaze a path for Ireland all over Europe and indeed, the world! I guess I should really start by introducing myself. My name is Ciara Judge and I'm a 17 year old 5th year student in Kinsale Community School, Ireland. I love music, and I play violin, piano and guitar (I got a ukulele for Christmas but realistically I can't say I play it yet). I'm quite opinionated, I have an irrational fear of sharks ever since I watched Jaws as a child, and in case the metaphor I use below confuses you, no I am not a spider. You could say that I do my homework, having got 12 A's in the junior certificate state exams, but results don't define me. Oh and yes, I am that science nerd that occasionally appears on the telly. I live what I like to call a 'Spiderweb Life.' Everyone has seen a spiderweb, and if you look closely there is something fascinating about the way it is structured (though if you're Australian you're more likely to run away in terror than to spend time examining it). There's a central point, and radiating out from it are these little triangular shaped 'pie slices'. When thinking about how I live I liken these pie slices to different disciplines: student life, science research, education outreach, being an AAT project ambassador, travel, etc. with myself standing in the middle alternating focus and juggling time between them. I have my fingers in many pies - but I like it that way, and it has led me to some interesting experiences. Because of the strangely diverse life I lead I hope this blog will have something for everyone- for students who, like myself, have to integrate study into their busy lives, for fans of science, or even those in industry. Ironic that I begin blogging now, given that the past three years of my life would have been the ones worth documenting, but at least you now get an insight into the aftermath of my being catapulted from a lowly 2nd year student to being one of the winners of the Google Global Science Fair. I hope to give out some study tips and advice, and document the trips I'll be going on in the coming year including the Galapagos Islands and the Mojave Desert, and of course you'll get all the news on my further work with the project from the horses mouth. Not only looking to the future, I'll also take a look back at the last three years, to explain how we started out and describe some of the key points along the way. First stop, however, on this cyber journey, will be next week's BT Young Scientist and Technology Exhibition which is always a highlight of the year. That just reminded me: I have a suitcase to pack! Realistically, with the way 2015 is looking, my suitcase will be in a permanently full state - not a bad way to live. p.s. If you see me in the RDS next week, come say hi! I'm only a little socially awkward and I promise I wont bite.